Maybe you find yourself in a situation where you have windows to cover in your home, office, cottage or rental property and you’d like to accomplish this task without breaking the bank or causing any unnecessary issues for yourself or someone that you’d have do the installation work. Out of all the window fashions available, blinds seem to be the most sensible choice to easily and affordably get the job done most effectively. However, don’t get blindsided by window blinds. It’s easy to go purchase blinds at hardware, department and home building stores. Some big box stores even offer custom cut window blinds either made to order in the store or by a special order from a manufacturer. It all depends on what you want to achieve and what you’re willing to go through to get it done. If it’s simply to just cover a small standard sized window tucked away where seldom seen, then it might possibly make perfect sense to pick up a set of blinds or a rollaway shade from a local store. You could even make an online purchase, however you run the risk of product damage during delivery as blinds tend to be boxed in awkward long dimensions that may pose a cumbersome challenge during transportation. Design installed treatments by Cadillac Window Fashions offer hassle free window coverings of high quality products in a plethora of materials and styles to best suit your décor, impeccable installation guaranteed and excellence in customer service beyond compare. Purchasing inexpensively priced blinds from a store, whether off-the-shelf or cut to order, may initially seem like a real savings to you; however, many who take this route seem to be replacing their blinds before they should really have to. Any savings that may have originally been enjoyed will be eaten up if the purchased products need replacing. To steer clear of this unforeseen spending experience, it’s best to avoid in-store blinds as they tend to be of significantly lower quality. 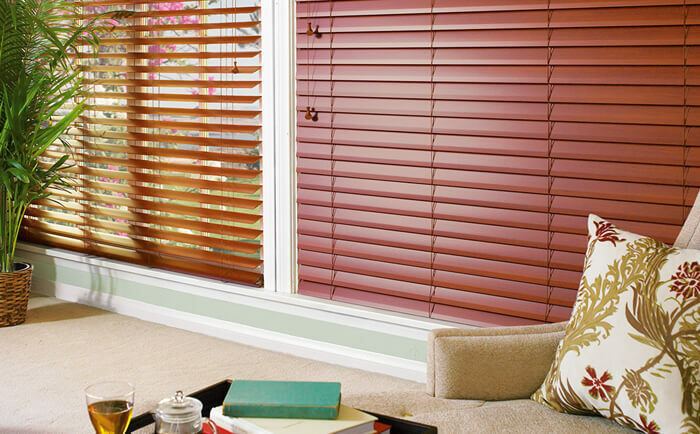 We only sell products of proven excellence, including Hunter Douglas Gallery blinds and treatments. We stand behind the quality of the window fashions we install and will address any issues that may arise to ensure complete customer satisfaction. Selection is not great for window blinds purchased in department/hardware/home building stores. Some stores offer more colour and style selection than others, but don’t expect the freedom of a wide array of options to choose from. You may have to forego décor synergy with limited in-store options available. We’ve also heard stories from some customers who became frustrated when they placed a special order for blinds from a manufacturer only to wait an over extended amount of time before discovering the product item was actually discontinued. That wouldn’t happen with us at because we’re on the ball with our manufacturers and wouldn’t show customers products that were not available. Our Design Consultants spend the required time with each customer to clearly identify their window dressing needs and present the most appropriate options available to best suit the look and feel desired to achieve. Some people, especially interior designers, are fixed on a certain colour palette, design feature, décor style or treatment design thus demanding our services. All needs, desires and requirements are taken into consideration to offer you a breadth of selection that will please both the eye and the wallet. It’s easy to run into measurement issues when purchasing store bought blinds, even if buying made to order cut. You or someone you get to do the installation work will be responsible for measuring the height and depth of your window openings before making a buying decision. Since you’re in the store and the windows needing covering are not, the margin for measurement error is evident which can thus easily cause issues during installation, possibly even re-installation, replacement or repair of any damage done to window, frame or wall, depending on the skills of the person putting up the blinds. Our Design Specialists clearly ensure windows are precisely measured for the desired window treatment installation. Accurate measurements and impeccable installation is not only provided to all customers by us, it is demanded by us, guaranteed. We welcome you to contact us today and request a free quote. Visit our website and showroom, which is conveniently located in Woodbridge, or we can make arrangements for one of our Design Consultants to come out to you and discuss your treatment options, whether it be blinds, shutters, drapery or a combination. We beautify windows and glass doors in homes, professional offices, retail spaces and all types of properties in Toronto, the GTA, Newmarket, Markham, Brampton and more. We look forward to adorning your windows with stylish excellence!